Nums: Did Clinton really end welfare as we know it? Surprised me, but the answer is yes. Clinton’s (and Gingrich’s) initiative to pare the welfare rolls cut the number of people on welfare from about 5 million to under 2 million. Surprising to me, the number has held pretty constant for the past 15 years or so. As loyal readers know, I’ve been trying to get my arms around this question. 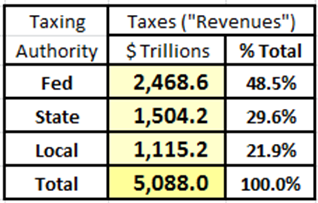 We posted that in 2012 Americans will pay a tad over $5 trillion in taxes to the Feds, States and Local Governments. Welfare: How much has been spent since LBJ declared the war on poverty? Answer: About $17 trillion … but, there’s much more to the story. There has been so much talk about welfare recently that I did some digging … not to judge good or bad, simply to to get some facts. According to Congressional testimony given by the Heritage Foundation, “welfare” refers means-tested federal programs providing cash, food, housing, medical care, social services, training, and targeted education aid to poor and low income Americans. Means-tested programs are anti-poverty programs: they are intended to increase the living standards of improve the capacity for self-support among the poor and near-poor. Means-tested welfare spending or aid to the poor consists of government programs that provide assistance deliberately and exclusively to poor and lower-income people. For example, food stamps, public housing, Medicaid, and Temporary Assistance to Needy Families are means-tested aid programs that provide benefits only to poor and lower-income persons. Non-welfare programs provide government benefits and services for the general population — all income levels. For example, Social Security, Medicare, police protection, and public education are not means-tested per se. 2 child care and child development programs. Since the beginning of the War on Poverty, government has spent $15.9 trillion (in inflation-adjusted 2008 dollars) on means-tested welfare. In FY2011, federal spending on means-tested welfare, plus state contributions to federal programs, were about $940 billion. Combined federal and state means-tested welfare is now the second largest category of overall government spending in the nation. Means-tested welfare is exceeded only by the combined cost of Social Security and Medicare. Welfare spending is greater than the cost of public education and is greater than spending on national defense. Total means-tested spending in 2008 was $708 billion … about $7,700 to $17,100 in means-tested spending for each poor American (depending on the estimating method) … on average, around $30,000 to $33,000 for a family of four … with about 1/3 of the amount going to medical care. In FY 2011, total means-tested spending going to families with children … was around $33,000 per low income family with children. 37 percent was spent on cash, food, and housing aid. 11 percent was spent on social services, training, child development, targeted federal education aid, and community development. Roughly half of means-tested spending goes to disabled or elderly persons. The other half goes to lower-income families with children, most of which are headed by single parents. Most of these lower-income families have some earned income. Average earnings within the whole group are typically about $16,000 per year per family. If average welfare aid and average earnings are combined, the total resources available come to between $40,000 and $46,000 for each lower-income family with children in the U.S. … about 15% below the total population’s median household income. If Floridians want welfare, they’ve got to ditch drug use. Florida Gov. Rick Scott signed a bill last week that would require welfare recipients to take a mandatory drug test. Applicants for the federal Temporary Assistance for Needy Families program who test positive for illicit substances won’t be eligible for the funds for a year, or until they undergo treatment. Those who fail a second time would be banned from receiving the funds for three years. The logic: It will make sure taxpayers aren’t subsidizing drug use. The legislation instantly came under a barrage of criticism from the American Civil Liberties Union and several of the Sunshine State’s Democrats. Their shout-outs: “unfair”, “invasion of privacy, “unconstitutional”. Person A: We don’t want to subsidize drug use. Person B: You got no right to tell me how to spend my money. Person A; It isn’t YOUR money. Person B: Yes it is ! Person B: Welfare ain’t no job.